Trick question: What is the most important position on the football field? Most people — from some of the most highly-respected minds in the sport to casual fans simply responding to media and marketing training — would say it’s the quarterback. Some people would argue admirably for the offensive line. Others would cite the old sports adage “defense wins championships” to make a case for perhaps the linebackers or the D-linemen. They’re all wrong. The real answer is that every position on the football field is equally important. Don’t think so? Pull the left guard or the right tackle out of the huddle and see how well that All-American quarterback plays without them. Bring a novice holder or long-snapper into the game and watch how allegedly automatic extra points become less than automatic. Stick one weakside linebacker or nickelback out there who doesn’t know (or can’t fulfill) their assignment and witness an entire defense crumble. More than basketball, baseball, soccer or hockey, football is truly our most team-oriented sport because absolutely every individual on the field is critical to a team being successful. A football player can’t fade into the background and let his more talented teammate single-handedly take over a game. A football player can’t mentally check out for a few plays and get away with it because the ball happened to not come his way. We don’t have red cards or power plays in football because for one team to play short-handed would be completely unfair. Every position on the football field is equally important, and yet if everything you knew about the game had been learned from TV talking heads and commercials, mainstream media writers and Hollywood movies, you’d think a football team starts with the coach and ends with the quarterback, with the rest of the group not much more than a supporting cast of occasionally interesting characters. In my lifetime as a football fan (my father put a little rubber football in my hands while I was still a newborn at the hospital), football player (high school starter) and football media member (former Pac-12 beat writer, current freelancer), I’ve grown tired of and jaded toward the game’s culture of quarterback obsession and coach worship. Personally, I’ve always been drawn to defensive backs: the cornerbacks, safeties, nickelbacks, rovers and halfbacks (yeah, I watch Canadian football, too). I like to watch the guys who do some of their best work just beyond the limits of my TV screen. That’s why this publication exists. Part of it is by choice. As a little-leaguer, I always liked playing defense more than offense. As a kid on the playground, while everybody else was pretending to be Randall Cunningham or Barry Sanders, I wanted to be Deion Sanders or Tim McKyer. Even when I played basketball, I liked getting steals more than scoring buckets. And later on, in high school, I became a starter at cornerback. Part of it is by chance. 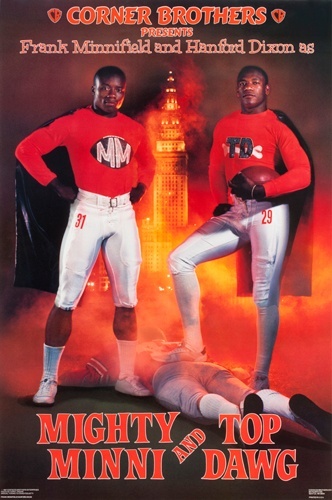 When I chose the Cleveland Browns as my favorite NFL team as a kid in the late-1980s, their defense featured a pair of Pro Bowl cornerbacks in Hanford Dixon and Frank Minnifield; strong safety Felix Wright, who led the league in interceptions in 1989; and hard-hitting free safety Thane Gash. In 1991, Cleveland added another star to its secondary by drafting UCLA safety Eric Turner. He would go on to make two Pro Bowls before falling ill unexpectedly and dying of intestinal cancer at just 31 years old. And I suppose another part of it is my contrarian tendency to go against the grain. The longer I watched football fans and even football’s rulebook favor offensive skill-position players — quarterbacks in particular — I grew increasingly intrigued by those who got in the way of their glory. Today, I believe defensive backs are not only the best athletes on the field, but also have the most difficult jobs. Then consider that with every league from the NFL to the CFL to the Arena League and down into the amateurs constantly looking for ways to increase scoring, a DB’s job is only becoming more challenging. And for that, DB’s don’t get nearly the amount of attention and admiration they deserve. So when I decided to start my own football publication, I knew I wanted to do something different and something that shines a light on those who are often overlooked. There are a million places where you can read all about Aaron Rodgers and LeSean McCoy and Calvin Johnson and Bill Belichick. Here, I’m going to focus on defensive backs on all levels from high school up to the pros. The Corner Office will have news, original features and interviews, and opinion columns about DBs. It will be a reference point for athletes, coaches and parents who are looking for camps, clinics and training tips for defensive backs. The Corner Office will ideally be your first source for the secondary.